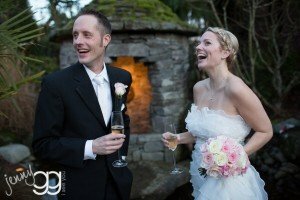 Married at The Willows Lodge in Woodinville on Februray 1st, this sweet couple built their wedding day by referrals only – venue, officiant, photographer and more. As you plan a wedding day – casual or formal – big guest list or tiny guest list – one of the best things you can do is to surround yourself with passionate wedding pros. If you have wonderful people around you on your wedding day and you are at a best venue that truly suits you with excellent service, chances are you’ll have one of those picture-perfect wedding days. And my imperfect definition of picture-perfect? Authentic, realistic timeline, fun surprises, time for a couple to have private moments, awesome cake or pastry (sorry, I’m a sucker for baked goods!) and a legacy of gorgeous photos.